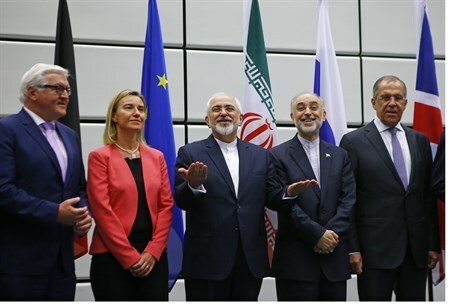 An official announcement of the Iran nuclear deal was made early Tuesday afternoon in Vienna by negotiators from Iran, the EU, and the P5+1 group of world powers including the US, UK, France, Germany, China and Russia. EU foreign policy chief Federica Mogherini sat next to Iranian Foreign Minister Mohammad Javad Zarif with other officials in an announcement ahead of a final closed door session, which was characterized by a jovial and celebratory atmosphere. During the closed session, Mogherini announced via Twitter that "#IranTalks done. We have the agreement. #IranDeal." Afterwards, a joint announcement was made, but not before a joint photo of Mogherini, Zarif, Russian Foreign Minister Sergei Lavrov, British Foreign Secretary Philip Hammond, and US Secretary of State John Kerry, French Foreign Minister Laurent Fabius, and German Foreign Minister Frank Walter Steinmeier. Mogherini then spoke, saying the long talks that have stretched on since an interim deal in November 2013 delivered results. "This is an historic day," she said, claiming that the ten-year dispute on Iran's nuclear program was solved. The final text on a deal has been sealed and it includes the lifting of all UN sanctions against Iran, she said, adding, "we know that this deal will be subject to intense scrutiny" but it is a "good deal." Zarif then read Mogherini's statements in Farsi, joking, "don't worry, it's the same statement." Before the final closed session, Mogherini and Zarif had made public statements to reporters. Zarif called the nuclear deal a "win-win" solution but not perfect, saying it will open "new horizons." "I believe this is an historic moment," said Zarif. "We are reaching an agreement that is not perfect for anybody but is what we could accomplish. Today could have been the end of hope, but now we are starting a new chapter of hope." Mogherini for her part said the deal will "open the way to a new chapter in international relations," and show diplomacy can overcome tensions. "This is a sign of hope for the entire world," she claimed of the deal with the leading state sponsor of terror. Fabius said the nuclear deal will hold solid for at least ten years; he did not elaborate what would happen afterwards. He said world powers will carefully scrutinize how Iran uses the massive funds freed up in the lifting of sanctions. Iranian and Western diplomats revealed earlier on Tuesday morning that the deal had been signed. Diplomats indicated that the deal would stipulate that the UN arms embargo on Iran, the leading state sponsor of terror, would remain for five years, after which it presumably would be removed. On Monday the White House dodged questions about lifting the arms embargo. The surprising concession on conventional weapons would appear unrelated to the nuclear focus of the deal; Iran's ICBM (intercontinental ballistic missile) program needed to deliver nuclear strikes has for its part been left out of the talks. Diplomats also said UN missile sanctions on Iran will stay in place for eight years, and that Iran accepted a "snapback" plan whereby sanctions will be put back in place if it is found to be violating the agreement. Critics have warned the sanctions have not blocked Iran's nuclear program. Separately a "road map" deal was signed with the UN's International Atomic Energy Agency (IAEA) promising to clarify the military aspects of Iran's nuclear program by the end of 2015, as IAEA head Yukiya Amano announced in Vienna.